At the World Show in 1988. This was early-on when all the yearling heifers showed in one class. There were 86 entries in the 1987 heifer class in 1988. The winner was Queen of Kings by King out of a Don Abraham daughter named Melody. L to R. Joel, Darol and Linda Dickinson. The following year the class breaks were divided to 4 classes. 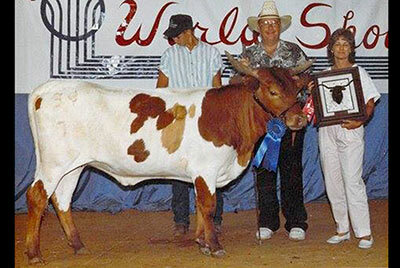 This was the largest class in the history of the World Show or any Longhorn show system. She was later purchased from DCCI by Bill & Sue Burton and became the foundation of a large part of both the DCCI and Burton herd.